Tyrosine or 4-hydroxyphenylalanine is one of the 20 standard amino acids that are used by cells to synthesize proteins. It is a non-essential amino acid with a polar side group. The word "tyrosine" is from the Greek tyros, meaning cheese, as it was first discovered in 1846 by German chemist Justus von Liebig in the protein casein from cheese. It is called tyrosyl when referred to as a functional group or side chain. While tyrosine is generally classified as a hydrophobic amino acid, it is more hydrophilic than phenylalanine. It is encoded by the codons UAC and UAU in messenger RNA. A protein kinase is a kinase enzyme that modifies other molecules, mostly proteins, by chemically adding phosphate groups to them (phosphorylation). Phosphorylation usually results in a functional change of the target protein (substrate) by changing enzyme activity, cellular location, or association with other proteins. The human genome contains about 518 protein kinase genes and they constitute about 2% of all human genes. Up to 30% of all human proteins may be modified by kinase activity, and kinases are known to regulate the majority of cellular pathways, especially those involved in signal transduction. Protein kinases are also found in bacteria and plants, and include the pseudokinase sub-family, which exhibit unusual features including atypical nucleotide binding and weak, or no, catalytic activity and are part of a much larger pseudoenzyme group of 'degraded' enzyme relatives that are found throughout life, where they take an active participation in mechanistic cellular signaling. Imatinib, sold under the brand names Gleevec among others, is a medication used to treat cancer. Specifically, it is used for chronic myelogenous leukemia (CML) and acute lymphocytic leukemia (ALL) that are Philadelphia chromosome-positive (Ph+), certain types of gastrointestinal stromal tumors (GIST), hypereosinophilic syndrome (HES), chronic eosinophilic leukemia (CEL), systemic mastocytosis, and myelodysplastic syndrome. It is taken by mouth. Protein tyrosine phosphatases are a group of enzymes that remove phosphate groups from phosphorylated tyrosine residues on proteins. Protein tyrosine (pTyr) phosphorylation is a common post-translational modification that can create novel recognition motifs for protein interactions and cellular localization, affect protein stability, and regulate enzyme activity. As a consequence, maintaining an appropriate level of protein tyrosine phosphorylation is essential for many cellular functions. Tyrosine-specific protein phosphatases catalyse the removal of a phosphate group attached to a tyrosine residue, using a cysteinyl-phosphate enzyme intermediate. These enzymes are key regulatory components in signal transduction pathways and cell cycle control, and are important in the control of cell growth, proliferation, differentiation, transformation, and synaptic plasticity. A serine/threonine protein kinase is a kinase enzyme that phosphorylates the OH group of serine or threonine. At least 125 of the 500+ human protein kinases are serine/threonine kinases (STK). Phosphorylation at tyrosine residues controls a wide range of properties in proteins such as enzyme activity, subcellular localization, and interaction between molecules. Furthermore, tyrosine kinases function in many signal transduction cascades wherein extracellular signals are transmitted through the cell membrane to the cytoplasm and often to the nucleus, where gene expression may be modified. Finally mutations can cause some tyrosine kinases to become constitutively active, a nonstop functional state that may contribute to initiation or progression of cancer. Cellular proliferation, as explained in some detail above, may rely in some part on tyrosine kinase. Tyrosine kinase function has been observed in the nuclear matrix. Lyn, the type of kinase that was the first to be discovered in the nuclear matrix, is part of Src family of tyrosine kinases, which can be contained in the nucleus of differentiating, calcium-provoked kertinocytes. Lyn, in the nuclear matrix, among the nuclear envelope and the “fibrous web” that physically stabilizes DNA, was found functioning in association with the matrix. Also, it appeared to be conditional to cell cycle. The contribution of the Lyn protein to the total tyrosine kinase activity within the nuclear matrix is unknown, however; because the Lyn was extracted only partially, an accurate measurement of its activity could not be managed. Indications, as such, are that, according to Vegesna et al. (1996), Lyn polypeptides are associated with tyrosine kinase activity in the nuclear matrix. The extracted Lyn was enzymatically active, offering support for this notion. An example of this trigger-system in action is the process by which the formation of erythrocytes is regulated. Mammals possess this system, which begins in the kidneys where the developmental signal is manufactured. The developmental signal, also called a cytokine, is erythropoietin in this case. (Cytokines are key regulators of hematopoietic cell proliferation and differentiation.) Erythropoietin's activity is initiated when hematopoietic cytokine receptors become activated. In erythrocyte regulation, erythropoietin is a protein containing 165 amino acids that plays a role in activating the cytoplasmic protein kinase JAK. The results of some newer research have also indicated that the aforementioned cytokine receptors function with members of the JAK tyrosine kinase family. The cytokine receptors activate the JAK kinases. This then results in the phosphorylation of several signaling proteins located in the cell membrane. This subsequently affects both the stimulation of ligand-mediated receptors and intracellular signaling pathway activation. Substrates for JAK kinases mediate some gene responses and more. The process is also responsible for mediating the production of blood cells. In this case, erythropoietin binds to the corresponding plasma membrane receptor, dimerizing the receptor. The dimer is responsible for activating the kinase JAK via binding. Tyrosine residues located in the cytoplasmic domain of the erythropoietin receptor are consequently phosphorylated by the activated protein kinase JAK. Overall, this is also how a receptor tyrosine kinase might be activated by a ligand to regulate erythrocyte formation. The epidermal growth factor receptor system, as such, has been used as an intermediate example. Some signals are produced from the actual cell surface in this case but other signals seem to emanate from within the endosomes. This variety of function may be a means to create ligand-specific signals. This supports the notion that trafficking, a term for the modification of proteins subsequent to mRNA translation, may be vital to the function of receptor signaling. There are over 100 3D structures of tyrosine kinases available at the Protein Data Bank. An example is PDB: 1IRK ​, the crystal structure of the tyrosine kinase domain of the human insulin receptor. By 2004, 58 receptor tyrosine kinases (RTKs) were known, grouped into 20 subfamilies. They play pivotal roles in diverse cellular activities including growth (by signaling neurotrophins), differentiation, metabolism, adhesion, motility, death. RTKs are composed of an extracellular domain, which is able to bind a specific ligand, a transmembrane domain, and an intracellular catalytic domain, which is able to bind and phosphorylate selected substrates. Binding of a ligand to the extracellular region causes a series of structural rearrangements in the RTK that lead to its enzymatic activation. In particular, movement of some parts of the kinase domain gives free access to adenosine triphosphate (ATP) and the substrate to the active site. This triggers a cascade of events through phosphorylation of intracellular proteins that ultimately transmit ("transduce") the extracellular signal to the nucleus, causing changes in gene expression. Many RTKs are involved in oncogenesis, either by gene mutation, or chromosome translocation,  or simply by over-expression. In every case, the result is a hyper-active kinase, that confers an aberrant, ligand-independent, non-regulated growth stimulus to the cancer cells. Gefitinib is well endured by humans, and treatment resulted in a symptom improvement rate of 43% (with 95% confidence in a 33%–53% interval) for patients that received 250 mg of Gefitinib and 35% (with 95% confidence in a 26%–45% interval) for those that received 500 mg. In the trial, epidermal growth factor receptor showed a rapid response to the inhibitor, as demonstrated by the improvement of the cancer symptoms. In each group, improvements were noted after a single week of epidermal growth factor receptor tyrosine kinase inhibitor treatment. Gefitinib application once per day caused “rapid” symptom improvement and tumor regressions in non-small cell lung cancer patients. In the field of medical research, this is an especially significant example of the use of an inhibitor to treat tyrosine kinase-associated cancer. Chemotherapy, surgery, and radiotherapy were the only major options available prior to the discoveries made in this trial. The side-effects of Gefitinib oral treatment once per day were considered significant. Diarrhea was reported in 57% of patients in the 250 mg group and in 75% of the 500 mg group. One patient had diarrhea more severe than Grade 2, with up to six bowel movements in only one day. Also, a death occurred possibly due to epidermal growth factor receptor tyrosine kinase inhibitor treatment; however, the correlation is not exactly clear. In addition, skin toxicity was observed in 62% of patients in the 250 mg group. Nevertheless, the side-effects of Gefitinib were only “generally mild, manageable, noncumulative, and reversible.”  Unfortunately, ceasing to take the inhibitor may be the only reversal strategy of the unfavorable symptoms. Gefitinib still represents a reasonably safe and effective treatment compared to other cancer therapies. BCR-ABL is a constitutively activated tyrosine kinase that is associated with chronic myeloid leukemia. It is formed from a fusion gene when when pieces of chromosomes 9 and 22 break off and trade places. 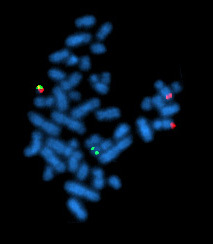 The ABL gene from chromosome 9 joins to the BCR gene on chromosome 22, to form the BCR-ABL fusion gene. Tyrosine kinase activity is crucial for the transformation of BCR-ABL. Therefore, inhibiting it improves cancer symptoms. Among currently available inhibitors to treat CML are imatinib, dasatinib, nilotinib, bosutinib and ponatinib. An oncogene is a gene that has the potential to cause cancer. In tumor cells, they are often mutated or expressed at high levels. Zalutumumab is a fully human IgG1 monoclonal antibody (mAb) directed towards the epidermal growth factor receptor (EGFR). It is a product developed by Genmab in Utrecht, the Netherlands. Specifically, zalutumumab is designed for the treatment of squamous cell carcinoma of the head and neck (SCCHN), a type of cancer. The ErbB family of proteins contains four receptor tyrosine kinases, structurally related to the epidermal growth factor receptor (EGFR), its first discovered member. In humans, the family includes Her1, Her2, Her3 (ErbB3), and Her4 (ErbB4). The gene symbol, ErbB, is derived from the name of a viral oncogene to which these receptors are homologous: erythroblastic leukemia viral oncogene. Insufficient ErbB signaling in humans is associated with the development of neurodegenerative diseases, such as multiple sclerosis and Alzheimer's Disease, while excessive ErbB signaling is associated with the development of a wide variety of types of solid tumor. Receptor tyrosine-protein kinase erbB-3, also known as HER3, is a membrane bound protein that in humans is encoded by the ERBB3 gene. Non-receptor tyrosine kinases (nRTKs) are cytosolic enzymes that are responsible for catalysing the transfer of a phosphate group from a nucleoside triphosphate donor, such as ATP, to tyrosine residues in proteins. Non-receptor tyrosine kinases are a subgroup of protein family tyrosine kinases, enzymes that can transfer the phosphate group from ATP to a tyrosine residue of a protein (phosphorylation). These enzymes regulate many cellular functions by switching on or switching off other enzymes in a cell. Tyrosine-protein kinase CSK also known as C-terminal Src kinase is an enzyme that, in humans, is encoded by the CSK gene. This enzyme phosphorylates tyrosine residues located in the C-terminal end of Src-family kinases (SFKs) including SRC, HCK, FYN, LCK, LYN and YES1. ↑ Hanks SK, Quinn AM, Hunter T (July 1988). "The protein kinase family: conserved features and deduced phylogeny of the catalytic domains". Science. 241 (4861): 42–52. doi:10.1126/science.3291115. PMID 3291115. 1 2 3 4 5 6 7 8 9 10 11 12 13 14 15 16 Cox, Michael; Nelson, David R. (2008). Lehninger: Principles of Biochemistry (fifth ed.). W H Freeman & Co. ISBN 978-1-4292-2416-1. 1 2 3 4 5 6 7 8 9 10 11 12 13 14 15 Radha V, Nambirajan S, Swarup G (March 1996). "Association of Lyn tyrosine kinase with the nuclear matrix and cell-cycle-dependent changes in matrix-associated tyrosine kinase activity". European Journal of Biochemistry. 236 (2): 352–9. doi:10.1111/j.1432-1033.1996.00352.x. PMID 8612602. 1 2 3 Ruetten H, Thiemermann C (September 1997). "Effects of tyrphostins and genistein on the circulatory failure and organ dysfunction caused by endotoxin in the rat: a possible role for protein tyrosine kinase". British Journal of Pharmacology. 122 (1): 59–70. doi:10.1038/sj.bjp.0701345. PMC 1564904 . PMID 9298529. 1 2 3 4 5 6 7 8 9 10 11 12 13 14 15 16 17 18 19 20 Schaller MD, Borgman CA, Cobb BS, Vines RR, Reynolds AB, Parsons JT (June 1992). "pp125FAK a structurally distinctive protein-tyrosine kinase associated with focal adhesions". Proceedings of the National Academy of Sciences of the United States of America. 89 (11): 5192–6. doi:10.1073/pnas.89.11.5192. PMC 49256 . PMID 1594631. ↑ Dengjel J, Kratchmarova I, Blagoev B (October 2009). "Receptor tyrosine kinase signaling: a view from quantitative proteomics". Molecular BioSystems. 5 (10): 1112–21. doi:10.1039/b909534a. PMID 19756300. 1 2 3 4 5 Wiley HS, Burke PM (January 2001). "Regulation of receptor tyrosine kinase signaling by endocytic trafficking". Traffic. 2 (1): 12–8. doi:10.1034/j.1600-0854.2001.020103.x. PMID 11208164. ↑ Rinker S, Ke Y, Liu Y, Chhabra R, Yan H (July 2008). "Self-assembled DNA nanostructures for distance-dependent multivalent ligand-protein binding". Nature Nanotechnology. 3 (7): 418–22. doi:10.1038/nnano.2008.164. PMC 2556356 . PMID 18654566. 1 2 3 Silvennoinen O, Saharinen P, Paukku K, Takaluoma K, Kovanen P (July 1997). "Cytokine receptor signal transduction through Jak tyrosine kinases and Stat transcription factors". APMIS. 105 (7): 497–509. doi:10.1111/j.1699-0463.1997.tb05047.x. PMID 9269296. ↑ Bhise SB, Nalawade AD, Wadhawa H (December 2004). "Role of protein tyrosine kinase inhibitors in cancer therapeutics". Indian Journal of Biochemistry & Biophysics. 41 (6): 273–80. PMID 22900354. ↑ Gunby RH, Sala E, Tartari CJ, Puttini M, Gambacorti-Passerini C, Mologni L (November 2007). "Oncogenic fusion tyrosine kinases as molecular targets for anti-cancer therapy". Anti-Cancer Agents in Medicinal Chemistry. 7 (6): 594–611. doi:10.2174/187152007784111340. PMID 18045055. ↑ Weinberg, Robert A. (2007). The Biology Of Cancer. New York: Garland Science, Taylor & Francis Group, LLC. pp. 757–759. ISBN 978-0-8153-4076-8. 1 2 3 4 5 6 7 8 9 10 11 12 13 Kris MG, Natale RB, Herbst RS, Lynch TJ, Prager D, Belani CP, Schiller JH, Kelly K, Spiridonidis H, Sandler A, Albain KS, Cella D, Wolf MK, Averbuch SD, Ochs JJ, Kay AC (October 2003). "Efficacy of gefitinib, an inhibitor of the epidermal growth factor receptor tyrosine kinase, in symptomatic patients with non-small cell lung cancer: a randomized trial". JAMA. 290 (16): 2149–58. doi:10.1001/jama.290.16.2149. PMID 14570950. 1 2 Sordella R, Bell DW, Haber DA, Settleman J (August 2004). "Gefitinib-sensitizing EGFR mutations in lung cancer activate anti-apoptotic pathways". Science. 305 (5687): 1163–7. doi:10.1126/science.1101637. PMID 15284455. 1 2 Okamoto I (January 2010). "Epidermal growth factor receptor in relation to tumor development: EGFR-targeted anticancer therapy". The FEBS Journal. 277 (2): 309–15. doi:10.1111/j.1742-4658.2009.07449.x. PMID 19922468. ↑ Druker BJ, Talpaz M, Resta DJ, Peng B, Buchdunger E, Ford JM, Lydon NB, Kantarjian H, Capdeville R, Ohno-Jones S, Sawyers CL (April 2001). "Efficacy and safety of a specific inhibitor of the BCR-ABL tyrosine kinase in chronic myeloid leukemia". The New England Journal of Medicine. 344 (14): 1031–7. doi:10.1056/NEJM200104053441401. PMID 11287972. 1 2 3 4 5 6 Joensuu H, Roberts PJ, Sarlomo-Rikala M, Andersson LC, Tervahartiala P, Tuveson D, Silberman S, Capdeville R, Dimitrijevic S, Druker B, Demetri GD (April 2001). "Effect of the tyrosine kinase inhibitor STI571 in a patient with a metastatic gastrointestinal stromal tumor". The New England Journal of Medicine. 344 (14): 1052–6. doi:10.1056/NEJM200104053441404. PMID 11287975. 1 2 3 Blanke CD, Demetri GD, von Mehren M, Heinrich MC, Eisenberg B, Fletcher JA, Corless CL, Fletcher CD, Roberts PJ, Heinz D, Wehre E, Nikolova Z, Joensuu H (February 2008). "Long-term results from a randomized phase II trial of standard- versus higher-dose imatinib mesylate for patients with unresectable or metastatic gastrointestinal stromal tumors expressing KIT". Journal of Clinical Oncology. 26 (4): 620–5. CiteSeerX 10.1.1.690.6356 . doi:10.1200/JCO.2007.13.4403. PMID 18235121. 1 2 le Coutre P, Ottmann OG, Giles F, Kim DW, Cortes J, Gattermann N, Apperley JF, Larson RA, Abruzzese E, O'Brien SG, Kuliczkowski K, Hochhaus A, Mahon FX, Saglio G, Gobbi M, Kwong YL, Baccarani M, Hughes T, Martinelli G, Radich JP, Zheng M, Shou Y, Kantarjian H (February 2008). "Nilotinib (formerly AMN107), a highly selective BCR-ABL tyrosine kinase inhibitor, is active in patients with imatinib-resistant or -intolerant accelerated-phase chronic myelogenous leukemia". Blood. 111 (4): 1834–9. doi:10.1182/blood-2007-04-083196. PMID 18048643. ↑ Kuwai T, Nakamura T, Sasaki T, Kim SJ, Fan D, Villares GJ, Zigler M, Wang H, Bar-Eli M, Kerbel RS, Fidler IJ (May 2008). "Phosphorylated epidermal growth factor receptor on tumor-associated endothelial cells is a primary target for therapy with tyrosine kinase inhibitors". Neoplasia. 10 (5): 489–500. doi:10.1593/neo.08200. PMC 2373870 . PMID 18472966.